I was running errands this afternoon and discovered that the East Lake Street Reconstruction & Streetscaping Project has now started in the stretch from Hiawatha to the West River Parkway. However, I am a little worried about some of the small business that are currently located in the midst of this construction. 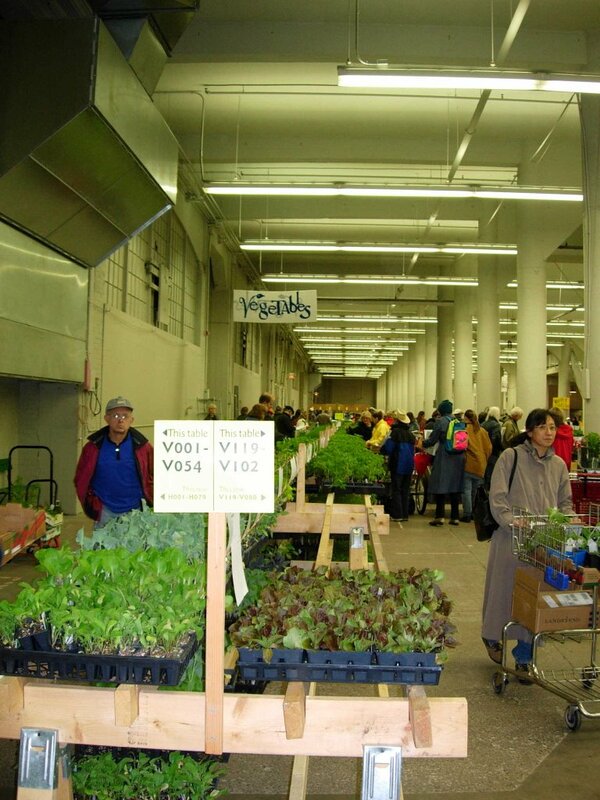 Many of them moved to East Lake Street when it was still a little dicey. That took courage & vision. It's obvious that many of them have put their heart & soul (not to mention their wallet) into rehabbing the old buildings and introducing quality businesses to the area. I'm hoping that area residents keep these businesses in mind during the construction and patronize them even if it does mean a little extra work to find parking, etc. Chinese Restaurant (don't know the name) - 43rd Avenue & E. Lake Street. I think Super America & McDonalds can probably survive without our help, but if I missed any other business that is worth a special trip, let me know! Also, if you visit one of these places during construction - come back and post a review! A few years ago a friend of mine showed me some tiny little flowers that were growing along his driveway. I couldn't believe it. The petals of the flowers looked hand painted. 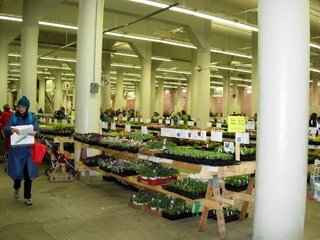 I looked for those little flowers in the local nursery for the past few years, but never saw them again. They looked similar to pansies, but were much smaller. And kind of like violets, but more detailed. This weekend I went to one of the local shops to find some plants to fill in a little circle garden in my front lawn. As I trolled the annuals, all of the sudden I saw them. A few lonely little plants left on the shelf. Turns out they were violas. Never heard of them, but that doesn't mean much as I'm not an experienced gardener. So, I grabbed what was left and made my way to the cash register. At the side of the register a little old lady was sitting with her walker. I think she was waiting in the cool of the indoors while her family was outside shopping. All of a sudden she kind of shouted out to me "Are those Johnny Jump Ups you are buying?." I looked over to see who she was talking to and she was looking at me dead on....and like I was some kind of simpleton for not knowing my flowers :-) She said it again "Do you have Johnny Jump Ups there?" I looked at the cashier and she said "I think those are those little ones." So, I grabbed one of the viola containers and brought it over to where the little old lady was sitting. She was so cute. She took one look at them and said "Yup, Johnny Jump Ups." 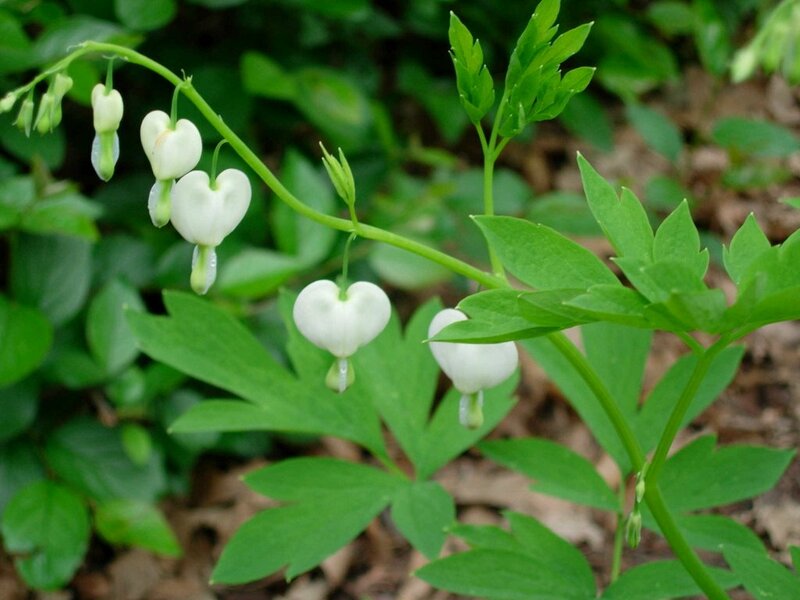 I think by this time she had gathered that I was a little clueless, so she instructed me to plant them in part sun.....and that "if I was lucky" they would come up year after year. 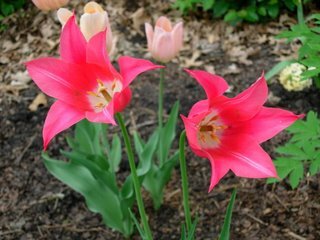 She told me she had planted them for years and years in her gardens. 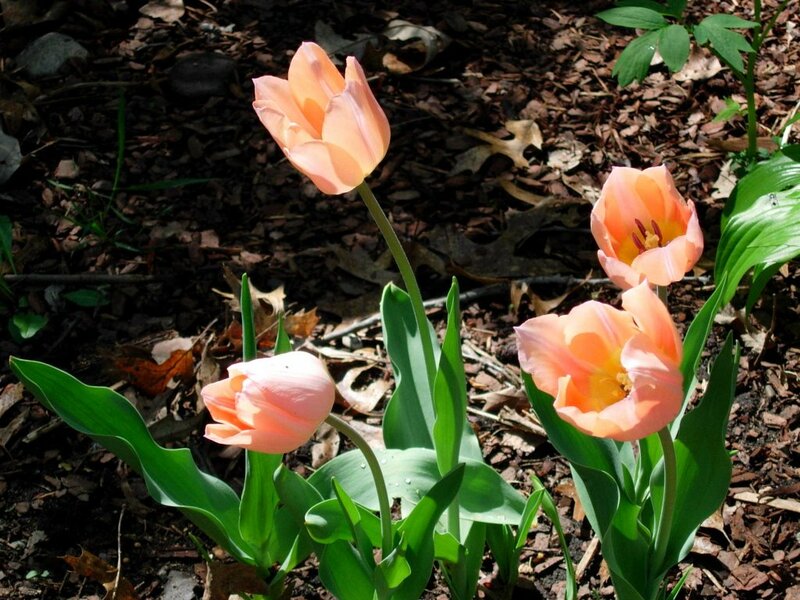 I've been trying to plant old fashioned flowers in my gardens, so this was fun to know. 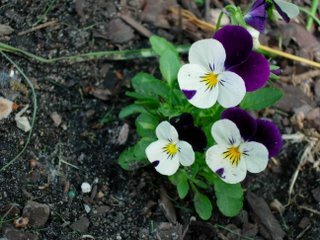 Violas or Johnny Jump Ups, I think these little flowers are very impressive. How do they know that each petal needs that exact design? Well, I think we all knew how this was going to turn out. I went back to the ReUse Center and bought the second sink. 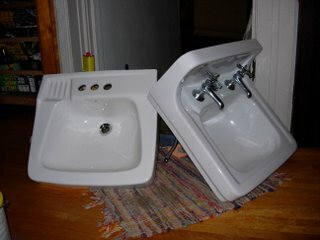 I now have two wall sinks sitting in my hallway. 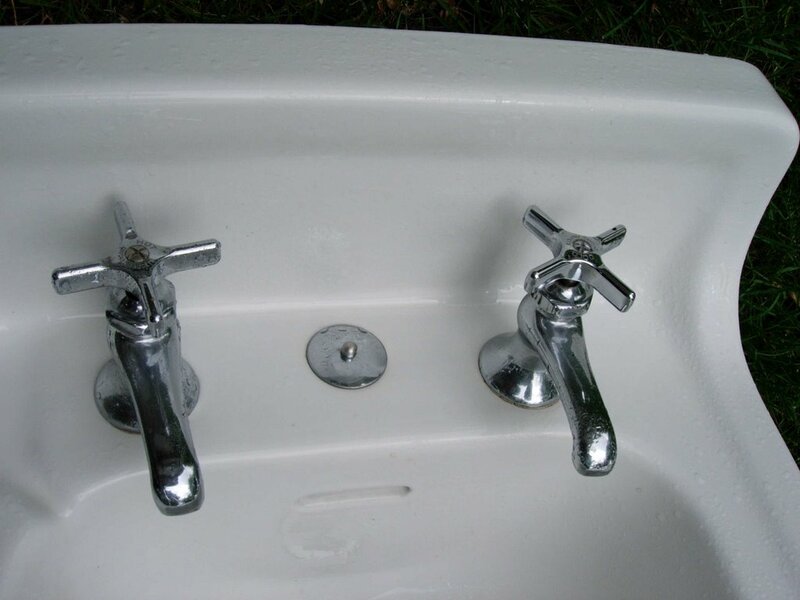 The second sink (on the right) is older than the first. It is an American sink and has a date stamp of Dec. 1929. It's in pretty spectacular condition for being that old. Not a chip on it and the finish is in excellent condition. The Chicago faucet looks to be original. the sink has that cool gray-white color that only the older pieces have - it matches my tub. 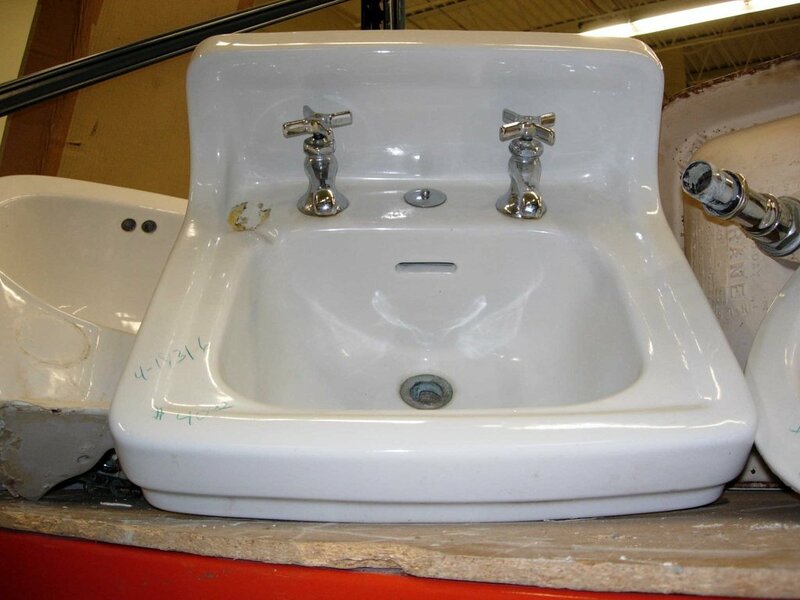 You can tell that whoever donated it actually cared - the sink was very clean. I nuked the thing with bleach, gave it a scrubbing and everything shines. You should see some of the stuff that sits in that salvage place - eew. Of course, now we have a tiny dilemma. 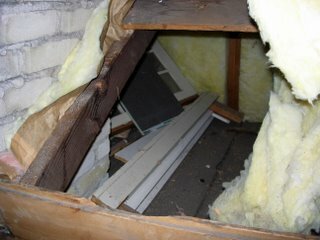 If you read my blog regularily you have discovered I can be a be a bit of a purist when it comes to old house topics. "If it's not broke, then leave it alone" is my mantra. It may cause me some stress to remove that old faucet. 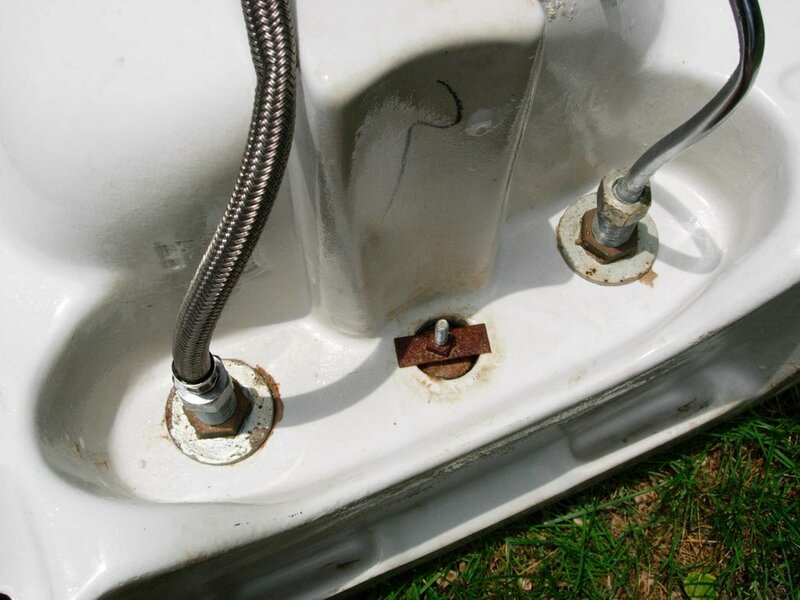 At this point I'm thinking that if I have a plumber out to move the pipes and install this sink....I should just have him add a new combined water faucet. Then I won't have to see him again for a while. I'm assuming this can be done as there are three holes in the piece. But still, that old faucet is so cute. What to do, what to do. I found a new wall sink for my bathroom last week. A few of the local salvage places keep a pretty good supply, and one day last week I just decided to go get one. This way, it will be ready when I finally get around to working on the bathroom again. 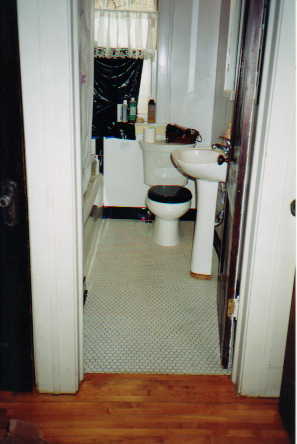 Once upon a time, my house had a wall sink in the bathroom. At some point it was removed and a new sink was installed. The sink in my bathroom now is the $29 (I kid you not) model from Menards. It is a fine, two piece unit. Essentially a very shallow wall sink and a slide in platform. It has taken to spontaneously cracking. 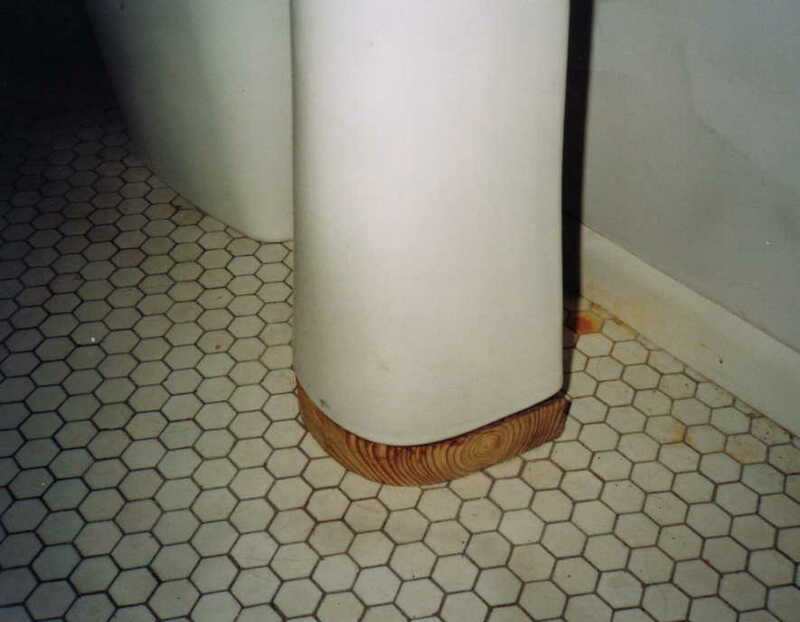 You will be standing there brushing your teeth and all of a sudden you will hear a popping noise and a new crack will appear. I really can't blame it. If I had been jacked up on this lovely wood platform, I'd probably spontaneously crack too. I'm not sure what the thought process was on that. They wanted the sink higher but didn't want to raise the pipe and putting the sink on a little wood platform seemed the perfect solution? For some reason, it humors me that they took the time to sand the edges of that little plaform....and thought it would be there long enough that they needed to use pressure treated wood. I dunno. Why not just leave the sink an inch lower? 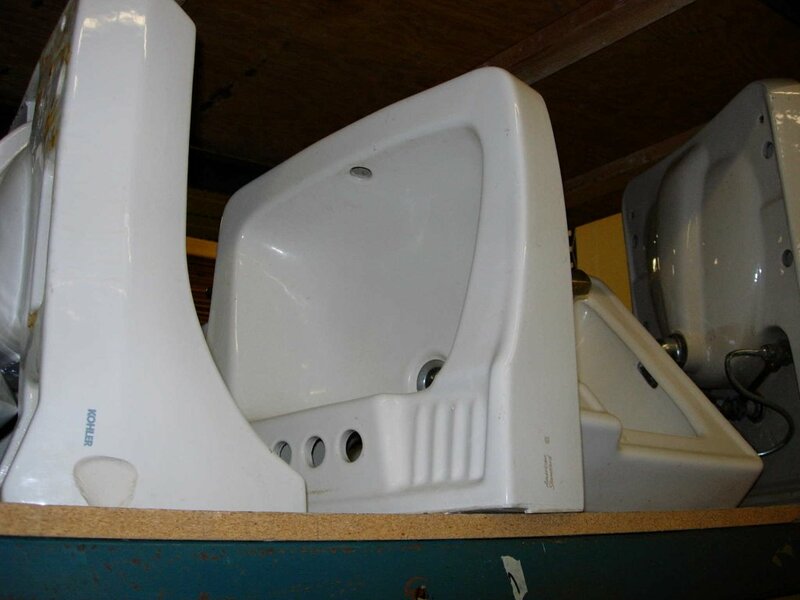 There were two sinks with possibility at the salvage place. Here is the one I bought for $45. It is an American Standard. It's actually smaller in dimension than my existing sink, yet the sink itself is larger. It is in excellent shape and cleaned up very well. The only drawback is that the faucet will need to be a 4" spread. For whatever reason, I seem to be drawn to the widespread faucets. It also does not have a backsplash, but it does have a cute little soap indentation and room for my "stuff." Here was the runner up. I still have a voice in my head that is telling me that I should run back and get this one too. Just in case. It has a nifty little backsplash and an 8" spread for the faucet. Right now it has the separate hot & cold faucets, but it does have a center hole that runs all the way through. I checked. If its still there, I can get it for $15. I probably will go back and get it....I don't want this to be one of those "why didn't I...." things. Its not like one more thing stored in my basement is going to make a huge difference. Then in the end, I can donate whichever one I don't use back to the salvage place. I think I may be overthinking this. I was a little concerned at first that when the P.O. tore out the plaster and drywalled the bathroom, they would have taken out the supports for the old wall sink. I was thinking that we would have to cut out the drywall and check and possibly add extra support. Patching drywall is not my thing. I was also wondering where in the heck I would find wall brackets. Not a big thing once I got to considering it as I (by "I", I mean my plumber) will be replacing the existing pipe (it's truly gross) and moving it up an few inches and over a few inches. I'll also be pulling out the awful 1980's medicine cabinet and putting in the vintage one I found last summer. So, that wall is gonna be pretty much open whether I like it or not. As luck would have it, when I looked under the existing sink I realized it is a wall sink and is bracketed to the wall. This past week I explored the last of the uncharted territory of my house. The space behind the knee wall drywall and the unfinished portion of the attic. This project took me a while because: 1) I had other projects going on everywhere that were more fun; 2) I needed to have another person there while I ventured into this dark abyss. Because, honestly, if the Boogie Man lives in my house - it is either in the knee wall space or the dark creepy closet below my basement stairs. 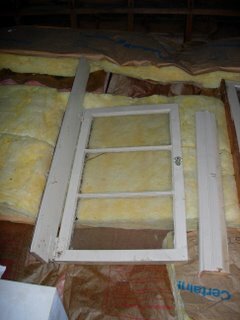 I needed someone available to call 911; and 3) I get irritated every time I go back there and have to face all of the insulation that the PO installed vapor barrier up. The reason for exploring this territory was two fold. First, to put down some poison on the chance that mice were able to make it up there. Secondly, to finally pull out the windows that showed up hiding behind the drywall during the infrared reading of my upstairs in my energy audit. Yup, the PO just put up the drywall and sealed up anything that happened to be stored there. I had convinced myself that the windows were actually the missing storm windows to my three casement windows in the sunroom. My roof is kind of odd in that it has two side gables and one forward gable. In order to reach that dead space, we needed to go into the forward gable unfinished attic space and remove some of the old knee wall boards from the finished attic space running the other direction. If you can't picture it, don't worry - its not key to the plot line. We got a few of the old boards pulled up and I had to squeeze myself down into the dead space. It was one of those moments where you loudly sing "lalalalalalalala" in your head to keep your mind from thinking. Once I got down in the space, I quickly arranged the items in there to pull out of the hole. The photo looks a whole lot more cheerful than it really was - keep in mind the flash lightened things up a whole bunch. It was hot, dark, dirty and creepy. When I was safely out of the space, I inpected the loot. There was a patch of maybe 30 boards of old maple flooring (ironically, I just bought some replacement boards last week). Where this was taken from, I still can't figure out. 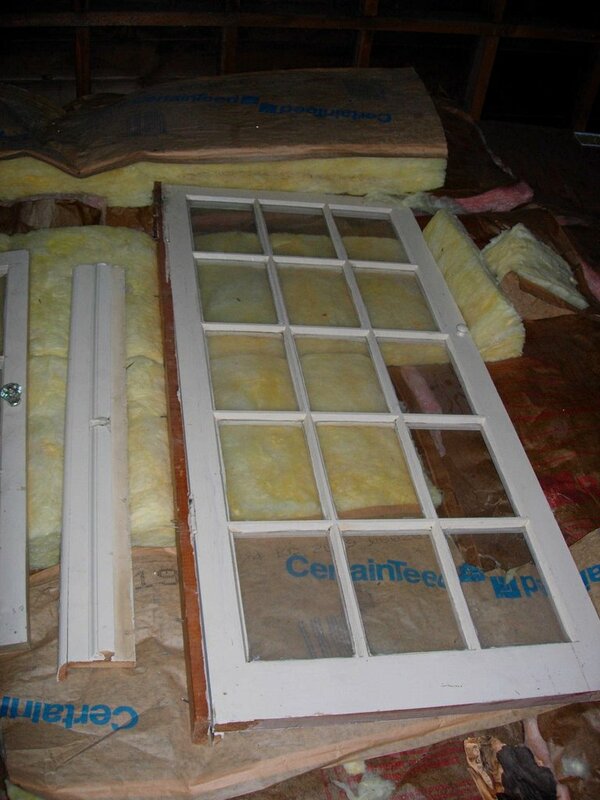 There was also one French door. And another window that at first I thought was one of the storms for my basement windows, but upon closer inspection also appears to be a door (it had a glass handle and one of those cabinet clips on the inside). The hinges don't match any of the window hardware in the house. A cabinet door or some sort of transom, perhaps??? So, of course instead of solving the mystery of where the storm windows went.......we now have two more myseries. 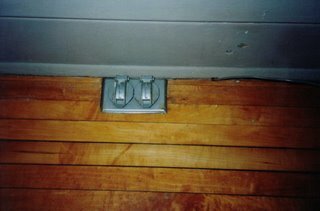 Were there built-ins upstairs? Why only one door - shouldn't their be a pair? 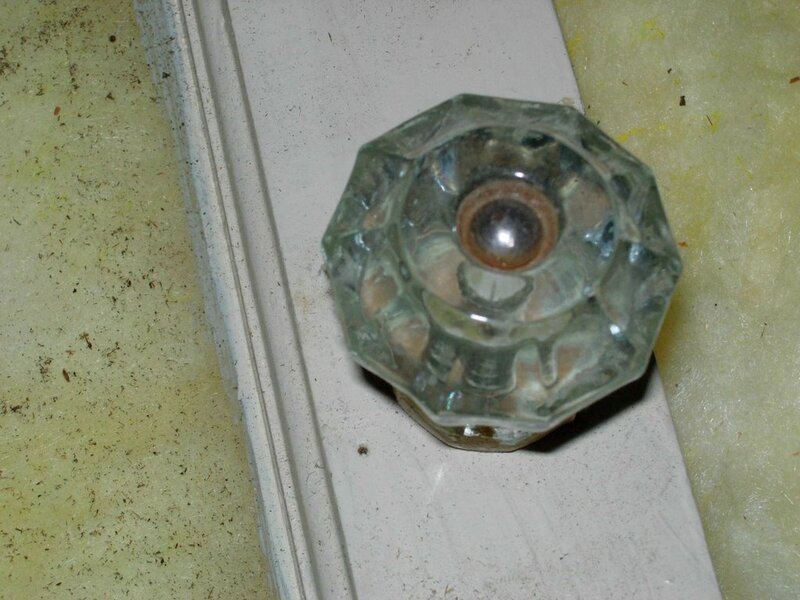 Could this be from the shadow of a cabinet that was on the wall in the kitchen at one time? And how weird is it that they are painted the exact color that I am painting my windows as I refinish them? Cold (41 degrees) and rainy day here. Generally crappie. 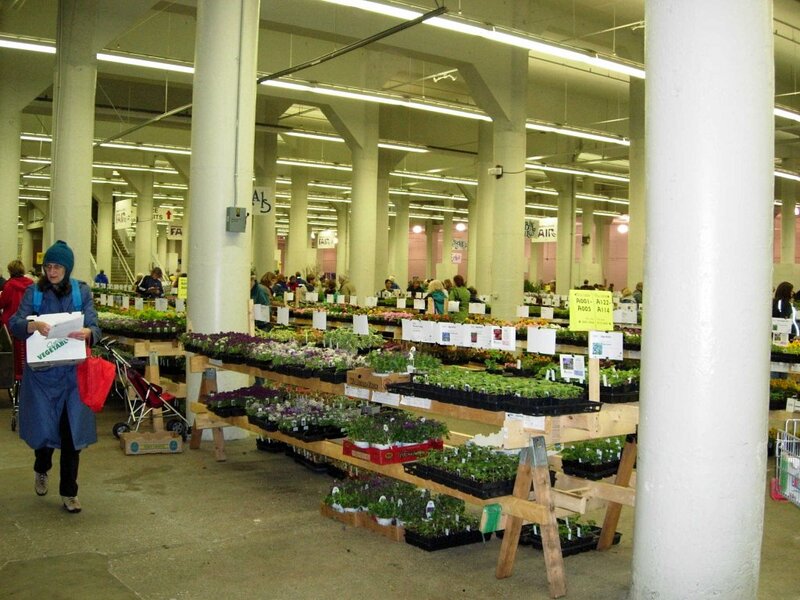 However, this did not stop us from hitting the Friends School Plant Sale at the State Fair Grandstand. When all was said and done, I had a cart of $105 worth of new plants for my gardens! I have 4 types of heirloon tomatoes, 2 Mortgage Lifter tomatoes, 1 Brandywine heirloom tomato. I also picked up two varieties of Rosemary. I decided I wanted to try a few funky things in my vegetable garden this year, so I picked up some Cuke-Nuts (small cucumbers) and Ground Cherries. The rest of my garden will be from seed. 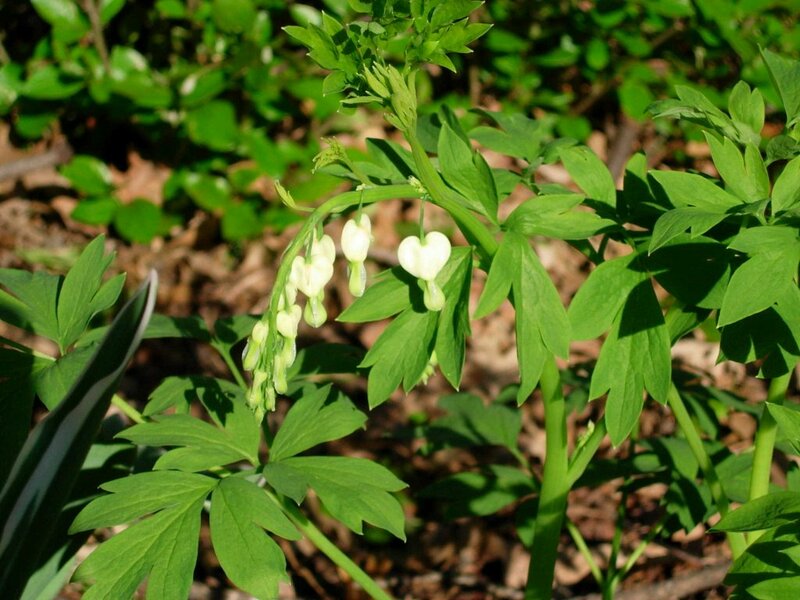 In the Bare Root Lily section, I found some pink Old Fashioned Bleeding Hearts (last year they sold out before I got there). 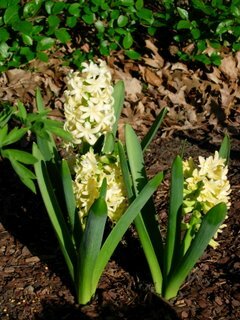 I picked up some Lily of the Valley to add to my current collection. And I also picked up some Blazing Star - which just looked pretty on the posters. 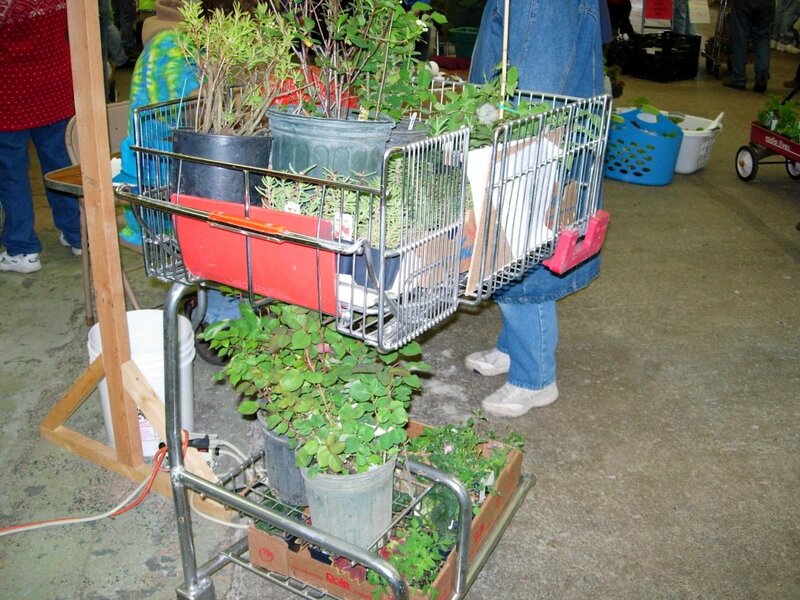 In the Rose section, I purchased a Baron Prevost "old fashioned" rose bush. 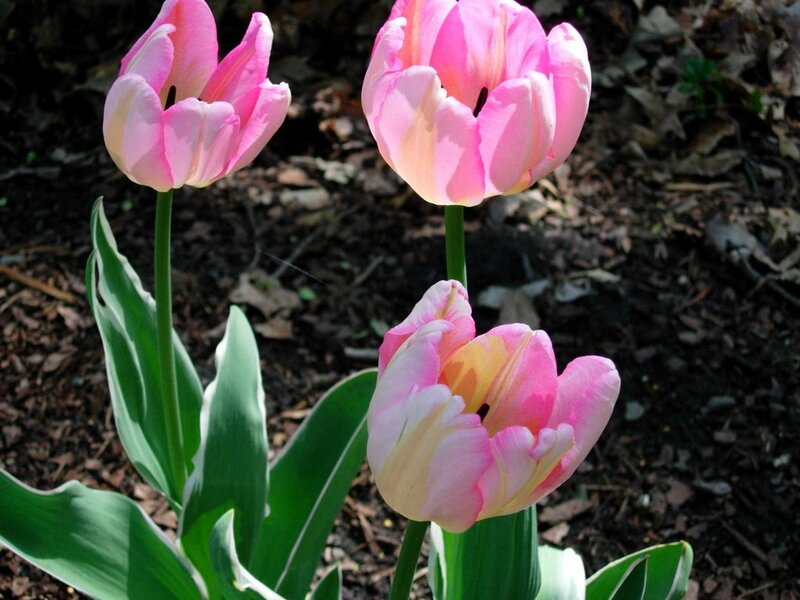 The flowers are pink and they tell me it will smell great. It will be planted on the side of my house. I purchase two Climbers. A Cup & Saucer and a Honey Suckle Trumpet. 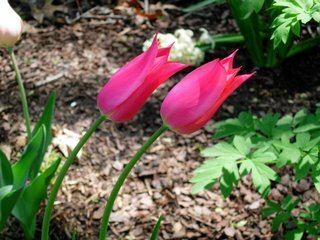 Both of these are slated for my backyard and were chosen purely by the photos posted above the plants....and the promise that they will bloom until first frost. Who knew I needed a ChokeCherry - Glossy Black bush? Well, turns out after reading that this bush will fill with small white flowers and then berries that I can pick and make into jam......I needed one. It is destined for my side yard along the fence where I can't get grass to grow anyway. Then for garden at the back of the house, I picked up an Orchid Lights Azelea. 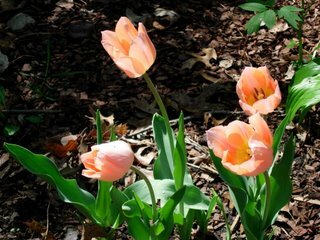 I figure this will be in full bloom and then be followed by my Peony flowers (that I bought as roots last fall). Finally, I purchased some Moss Roses for my front window boxes. Hopefully, they will fill in and bloom as a mass, so they look pretty from the street. This should take care of my "investment" perennials. I can now see why some people take their plants when they sell their house - my peonies & rose are going with me if I ever sell. Next year, I will probably only need to pick up a few items to fill in bare spots. I certainly can see how this garden thing can be addicting! and replace them with his fine vinyl windows. I think that part of the fun in restoring a house using vintage parts whenever possible is that life becomes like a big scavenger hunt. I have an ever growing list of things I am trying to hunt down. I carry a little card with measurements for my front door, bathroom sink, storm windows, kitchen cabinets, sash pulley sizes, needed light fixtures.... Whenever I have an hour to kill, I try to make a quick swoop through one of the local salvage places. This past Sat. I made one of those swoops through one of my regular spots......and in the back eyed a box full of "shortie" wood floor boards. I went back to investigate and discovered that they were 1.5" maple boards. I did a huge bunch of patching to the oak floors in my living room and & dining room when I first moved into my house 4 yrs ago (I'll blog about it one of these days). Oak is easy patch as you can easily get new/old wood and match it to the existing with stain or just a finish. Maple is another story. It develops a "toasted marshmallow" patina to it over time that is virtually impossible to replicate. 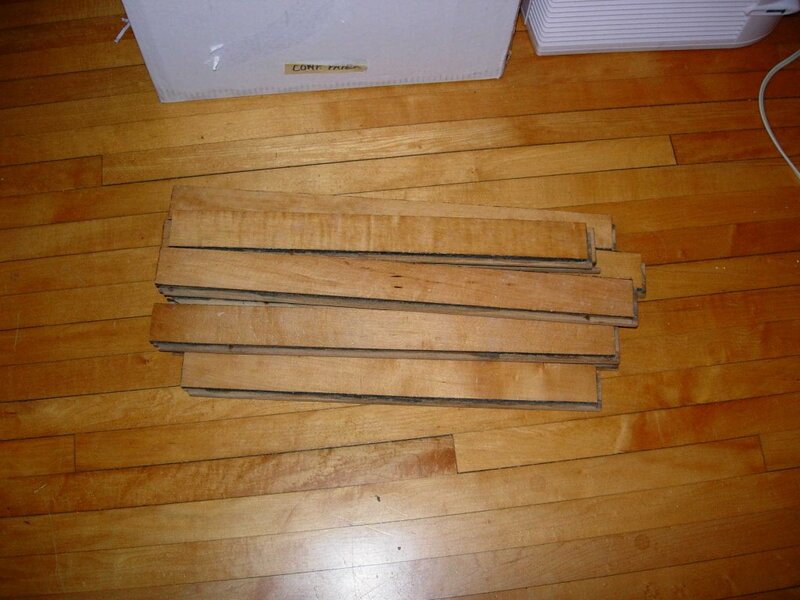 The cool thing about these boards is that they have a finish almost identical to my existing floors. I can make the patch and they will blend in immediately. The plan is to screen & coat these floors one of these days. Total cost for 15 boards. $0.60. The concrete guy has been found. This is good. He can't do the work until the end of May. This is bad. 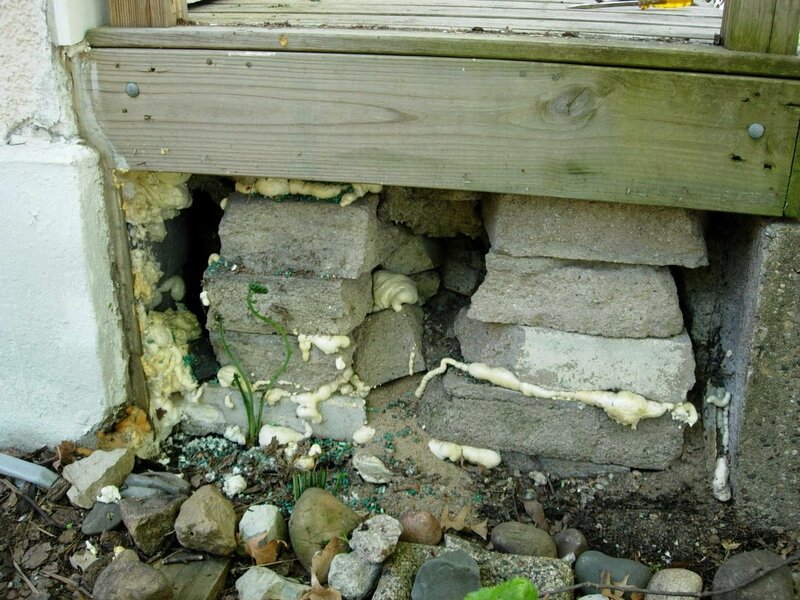 The reason this whole replacing-the-front-step project moved to the top of my priority list (besides the fact that the wooden platform & mailbox there now is an eyesore) is that mice have been getting into the walls of my house via the gap left by the missing step. I discovered this in mid November. It was too late to do any work on the concrete, so I closed up the area as best I could and went into denial. Thankfully, I had spent a huge amount of time weatherproofing my house and this paid off in the fact that the mice lived in the walls and couldn't enter the house, with the exception of the one visit in the kitchen which I promptly stopped. I'm a pretty calm person and not a lot stresses me out. Mice stress me out. Mice really stress me out. When I get stressed out I can't sleep. I also tend to over research the problem to learn more about it. In this case, big mistake. On some website I read that mice can multiply from a few to a few hundred in a month or so. Correct or not, my imagination took over. 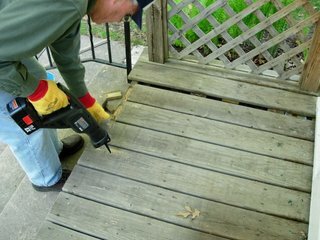 So with a month left before any work can be done replacing the step, last Thursday I conned my dad into coming over and helping me remove some the existing wood step to see if we could do some patch work on the foundation holes. The original plan was to take off the top layer and the sides and see if we could patch foundation holes with a cement patching mix. 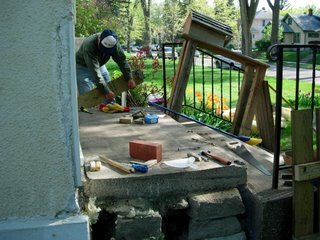 Then we were going to lay the top back on the whole thing and let it sit until the new concrete step was poured. We weren't exactly sure what was under the wood platform. I was going by memory of what I had seen last winter when I put up some hardware cloth on the side lattice work. I remembered large gaps in the concrete and some spots of missing foundation, but it was really cold back then and my memory is not great. My assumption had been that they had started to take out the old step and found it was too much work and just left the rest and built the platform over it. Once we got the top and the sides off, we figured out it really was a slab of concrete over a pile of concrete pieces. The top slab was actually in one piece and not in terrible condition. Originally there was a concrete handrail that would have covered the sides. 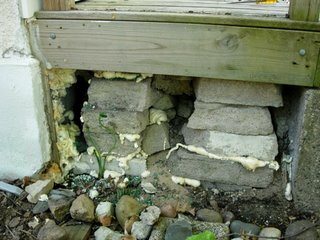 We also realized that while there were chunks of the face of the foundation missing, the holes into my house were actually where the board under the threshhold had been removed. We decided to just remove the whole thing and be done with it. 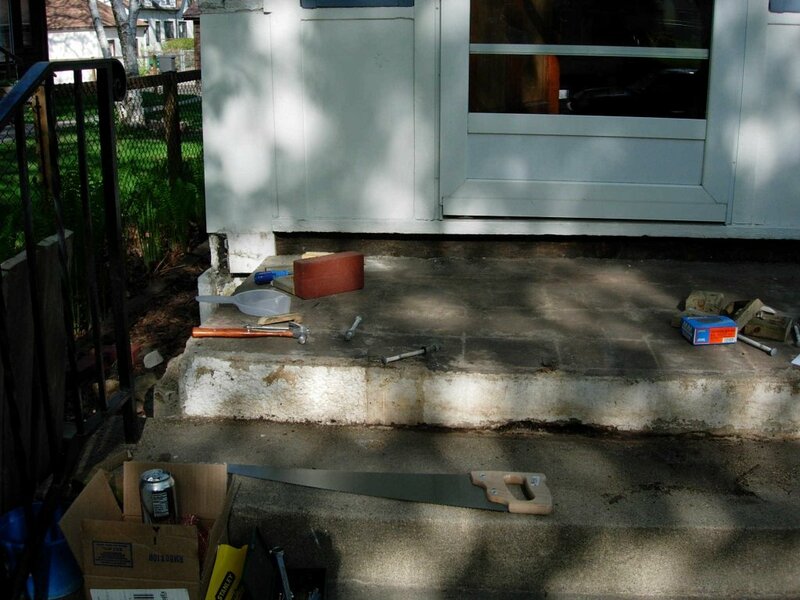 Once the wood platform was gone, I used copper mesh (similar to the brand Stuff-it)(purchased from Lee Valley Tools) to jam into the holes in the wood and concrete. 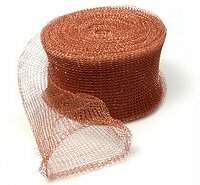 The copper is nice to work with because it is very flexible, animals can't chew through it, and it doesn't rust. For larger holes, we filled the mesh tube with a small amount if fiberglass insulation for bulk. 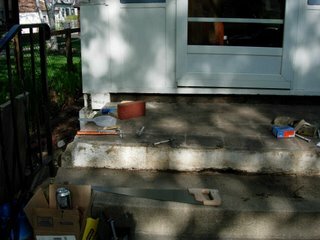 The old, uncovered step really doesn't look half bad. You can see where at one time tile had been placed on it. You can also see evidence of the small, enclosed entryway that my neighbor told me had been added then removed from the house years ago. 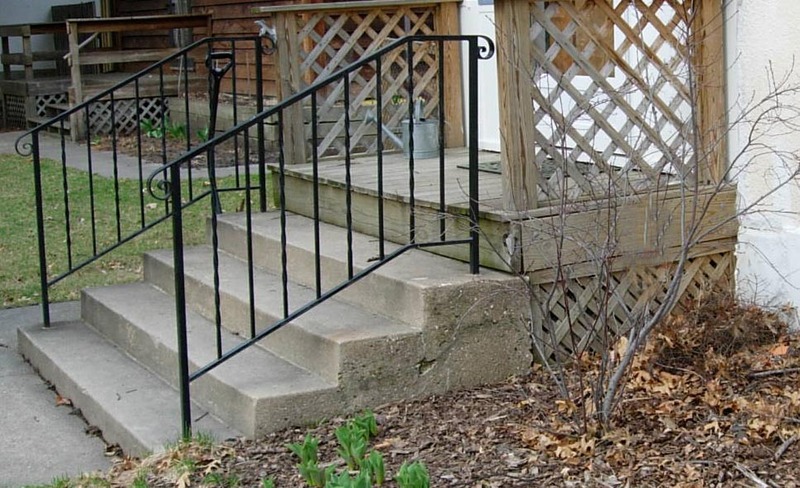 It looks like the riser of the step had a stucco finish layer on it at one time. Little snippets of history. Hopefully this is the beginning of a speedy end to this whole saga. I have a new concrete guy lined up to redo my front steps. This was not as easy a task as I would have liked. I went through the Better Business Bureau phone book and looked at ads. Then I looked at their website, if they had one. Then I checked for complaints on the MN BBB online site. I lost faith in Angie's List long ago, but did give them minor points if they mentioned a service award from AL. My method this time had me calling smaller contractors in the outer ring suburbs. I figured (right or wrong) that I would be a bigger job for them, therefore more likely to get a bid....and their overhead may be lower. I put in two calls and left messages. I didn't hear back. The next afternoon, I decided to take a walk to get some air and regroup. At some point during my walk, I started noticing the contractor name stamps on replaced city sidewalks. I got about a mile from my house and thought I had a good lead. There was one contractor stamp that consistently appeared on sidewalk replacements that were well done and crack free. Gunderson Bros. I was all excited that I had a good lead. When I got home, I looked their number up in the Yellow Pages. Ha. They were a few blocks from my house. Alas when I called, their phone had been disconnected. I even went so far as to drive by their former headquarters. Recently closed. Another dead end. So, I put in two more calls to another couple of contractors. Low and behold, they both called back. Now we're talking. I made appointments with both for an estimate. The first guy came out and after talking to him, I knew we were not on the same wave length. I am sure he does good work. He seemed like the kind of guy who takes pride in his work. But, he was also a "new is better" kind of guy....talking to an "old is what I want" kind of girl. 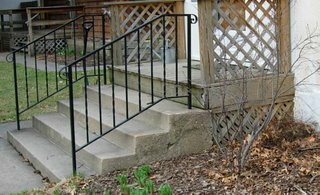 His bid had me cutting into my 80 yr old steps to bring them into current code, installing a new metal handrail, and lowering my new replacement stoop by 5" from it's original height. I explained to him that I just wanted the top stoop replaced. He explained to me that his bid would include what he outlined. 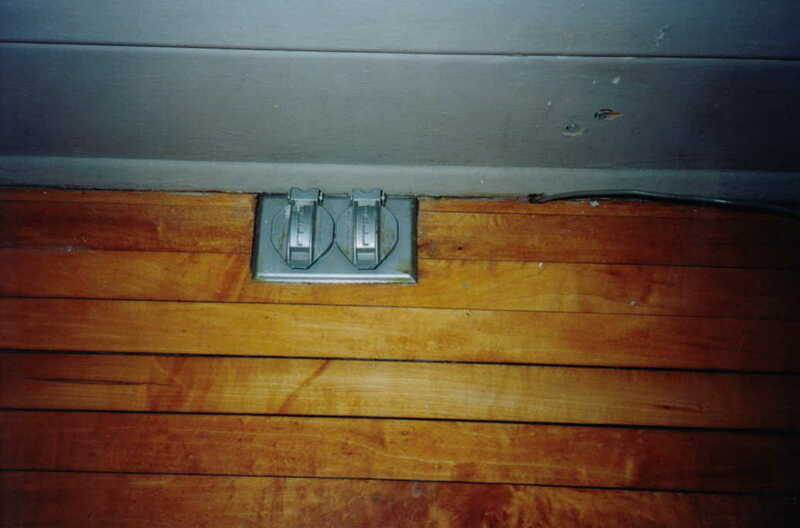 I've learned in working on my old house that the skill of the contractor is just one factor. Obviously there is also price. But equally important is that they appreciate and understand what it is you want to accomplish. You want them to to understand why it is they shouldn't cut through the plaster.....that the old hex tiles are a big deal......why you want to remove the aluminum soffits even if they are only 3 yrs old......that wavy glass is cool, etc. The second guy came out the next day. He was all business. 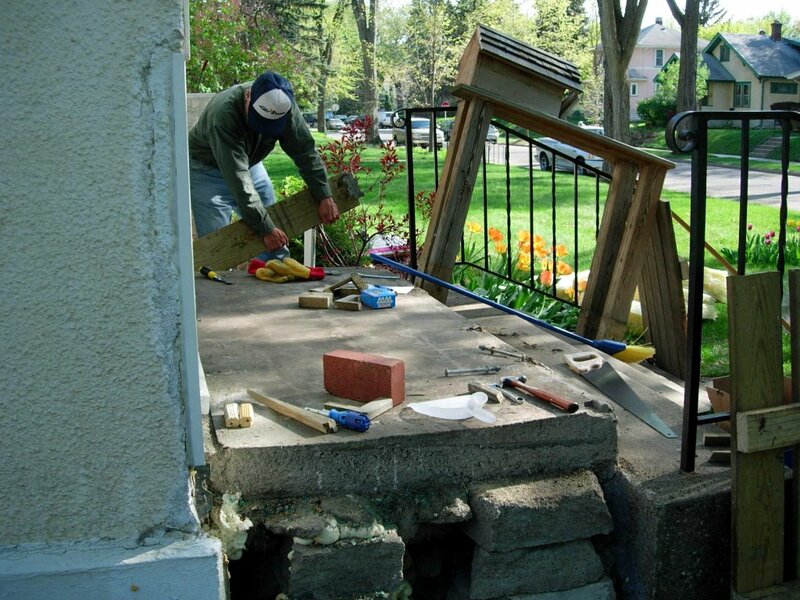 I explained to him that I wanted to keep the existing steps and replace the oh-so-attractive wooden top stoop. I told him I also wanted to add a sidewalk to the side of my house. He listened. He told me how he would accomplish this. Whew, our visions matched. 4000 psi. 6% air. rebar. An acid wash would give my new concrete a head start to looking old(er). If he cringed when I told him I liked the look of old concrete, he hid it well and I did not see it. And his price was quite reasonable ($2000 for all). I had my dad take a look at the contract specs. (he's a structural engineer and knows his concrete specs.) and then faxed the second guy a signed contract the next day. I'm on his calendar for the end of May. Hurrah! Wouldn't you know it that the minute I had a new guy lined up, my first flakey (we now know overpriced) concrete guy called me wondering when I wanted him to do the work. Evidently he had been hit in the head by a 2X4 or has been running a high fever that caused total amnesia because he did not remember any of our previous conversations where he had me on his calendar and promised to call.......Sheesh.